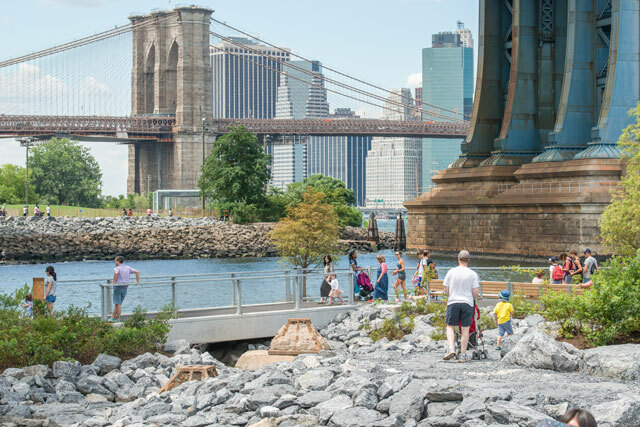 The Brooklyn Bridge Park connects sports fields and landscaped green space on the site of old shipping piers. © NYC & Company/Julienne Schaer. 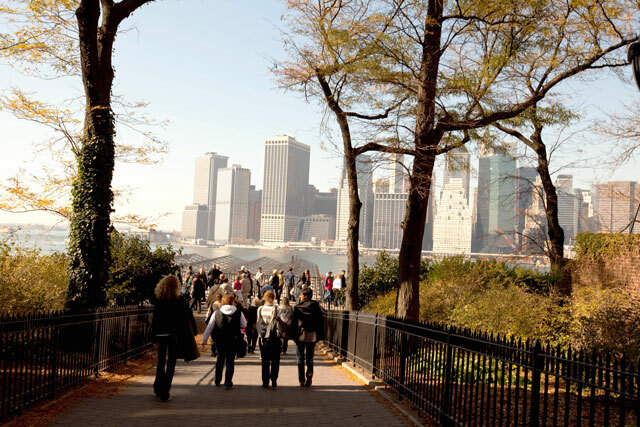 The Brooklyn Bridge Park offers glimpses of the Manhattan skyline. © NYC & Company/Julienne Schaer. Williamsburg has a reputation as the hippest neighborhood in Brooklyn. © NYC & Company/Jen Davis. 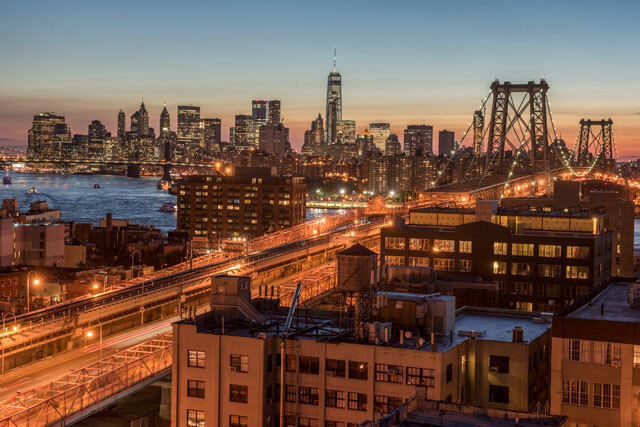 More visitors to the Big Apple are basing themselves in Brooklyn and for good reason. Brooklyn today would be America’s fourth most populous city had it not merged in 1898 with New York City. Its 2.6 million residents are a microcosm of the world with ethnic enclaves – from Ukrainians in Brighton Beach to Latinos in Bushwick. 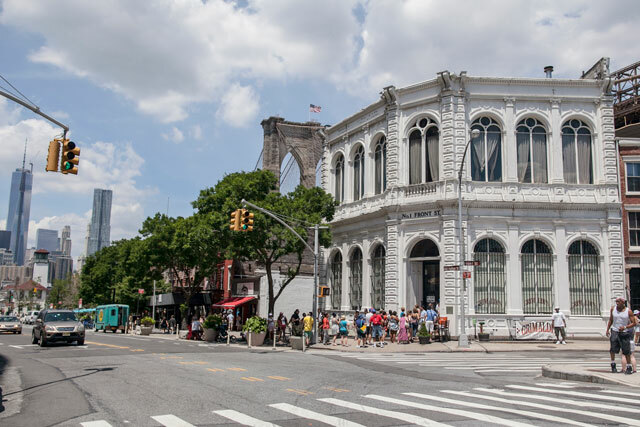 We’ll focus on a trio of neighborhoods in the shadows of Manhattan that highlight Brooklyn’s industrial past, revitalized present and trend-setting future. America’s first suburb has the largest concentration of pre-Civil War homes in the nation. 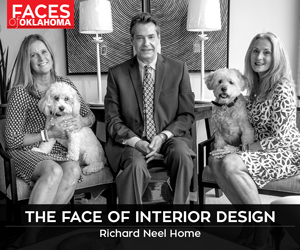 Tree-lined streets look much like they did in the mid-1800s, making it easy to see why this was designated the city’s first historic district and named one of America’s most beautiful neighborhoods. It’s so perfect that Sesame Street is based on it. The commercial corridor of Montague Street leads to the tranquil Brooklyn Heights Promenade for cinematic Manhattan skyline views. Stroll toward the Brooklyn Bridge, under which thrives the pizza institution Grimaldi’s. Arrive hungry – only full pies are served. For that special romantic meal, River Cafe Restaurant is tucked next to the bridge on a barge in the East River against a background of glittering skyscrapers. 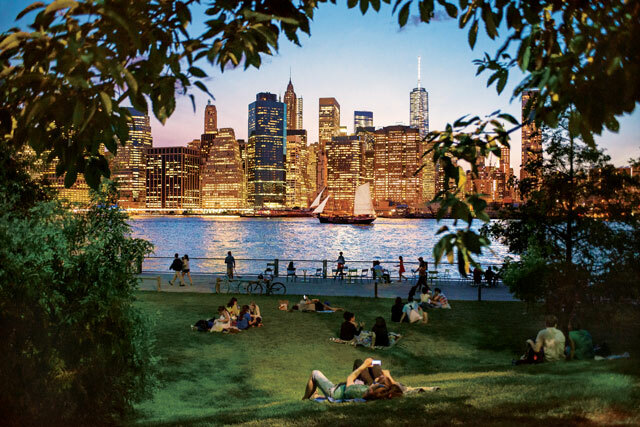 Also along the water, Brooklyn Bridge Park connects sports fields and landscaped green space on the site of old shipping piers. Even Brooklyn-shy Manhattanites cross the river to recreate here. 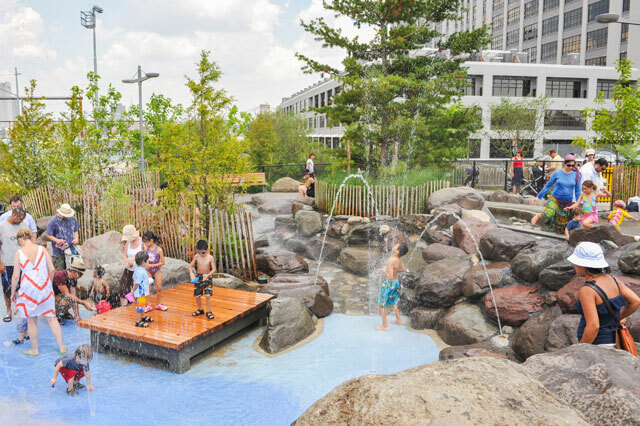 rooklyn Bridge Park Pier 6 holds many activities for New York residents. © NYC & Company/Julienne Schaer. holds its own cobblestone charm apart from the skyline visible across the Hudson River. © NYC & Company/Julienne Schaer. 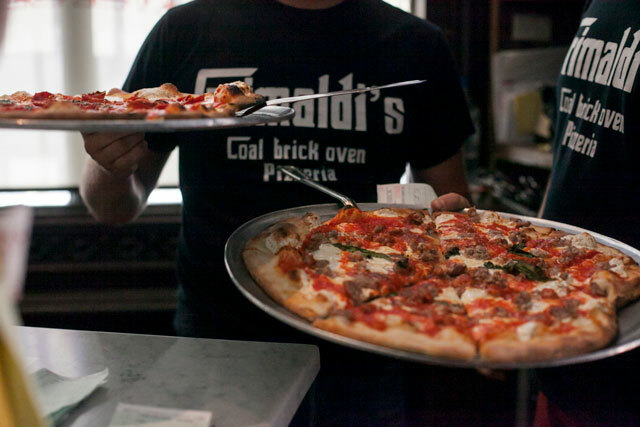 Grimaldi’s is located under the Brooklyn Bridge.© NYC & Company/Joe Buglewicz. Down Under the Manhattan Bridge Overpass, this neighborhood just north of Brooklyn Heights once hummed with factories making shoes, paint, machine parts, steel wool, coffee and sugar. Warehouses are now pricey loft apartments with boutiques and bistros occupying ground-floor loading docks. Despite gentrification, an artistic vibe remains. See what’s playing at avant-garde theater St. Ann’s Warehouse inside a repurposed brick tobacco warehouse. Meet Billyburg, Brooklyn’s hippest neighborhood. 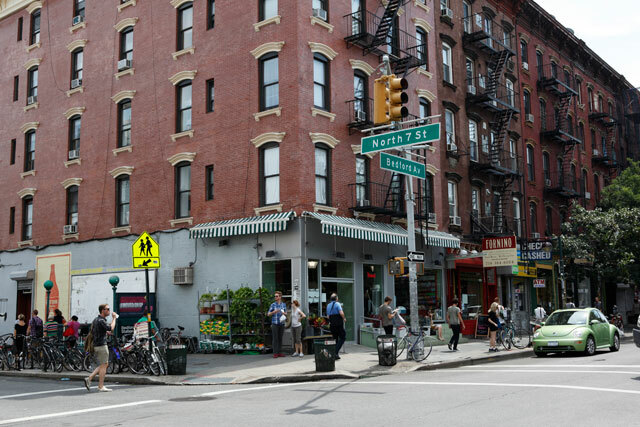 You can’t go wrong wandering Bedford Avenue, whose vibrancy feels more European than American. Soak up a French bistro atmosphere on the roof deck of Juliette Restaurant or eat and drink Italian style at Diviera Drive’s spacious tables. Wythe Hotel is a trendy place to stay or play; the rooftop bar is for scenesters. Keep it casual across the street by throwing strikes at Brooklyn Bowl or downing pints at Brooklyn Brewery. A towering new hotel, The William Vale, looks more Miami than Brooklyn and boasts the city’s longest hotel pool. A few blocks away, Hotel Delmano isn’t a hotel, but a throwback to Old New York with killer cocktails from the speakeasy days. Steak aficionados need look no further than Peter Luger, established in 1887 and arguably still the city’s best. You’re here for the porterhouse and remember to bring plenty of cash or debit cards. Every Saturday (April through November), the East River State Park hosts an eating frenzy called Smorgasburg. Indulge in artisanal sandwiches, ethnic noodles, homemade pretzels, jerky, ice pops and experimental creations that could be the next food craze. Just a block away, also on weekends, browse 100 sellers of art, fashion and vintage items at the Artists and Fleas market. Hipster Brooklyn is a real trend, and Diner is a shining example. Don’t ask to see a menu; there isn’t one. Your server scribbles the day’s dishes on the table inside an old railroad dining car. Local fave OddFellows Ice Cream scoops homemade exotic flavors near the old Domino refinery, which is being converted into – what else? – apartments. Sugar was one of Brooklyn’s biggest industries, so consider this an educational stop. End your BK extravaganza with a late-night flick at Nitehawk Cinema and order dinner and boozy drinks to your seat. 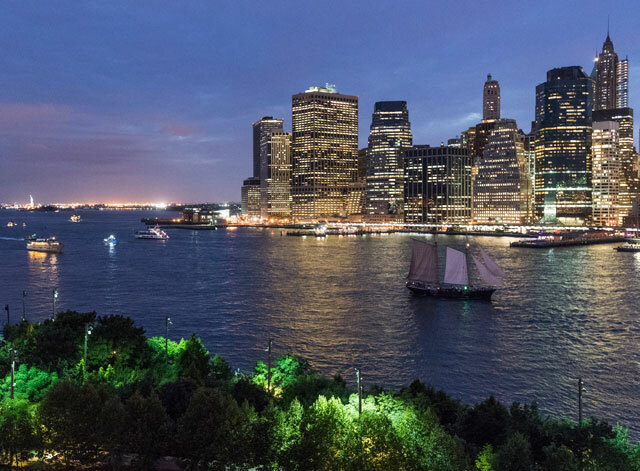 Manhattan, should you need it, is easily accessible by subway, Citi Bike or scenic walk over the Brooklyn, Manhattan or Williamsburg bridges.